Meow-WOW! Our shelter is extremely full of dogs right now!! Ugh! No offense to dogs, but this is just too much! The staff actually had to put a hold on accepting any more surrenders! I don’t recall that ever happening before. Fortunately the 2 dogs that came in during the night went back home first thing this morning, but then we had 1 stray dog and 4 more cats came in today. What a coincidence in timing too since Amador County came in to pick up Muffins, Rosie, and Abbie the cats for an adoption event they are having this weekend. We only had one dog adopted today, “Blake” a cute little puppy. I sure hope some more of those visitors that came in yesterday decide to come back soon to adopt a dog. It’s gotten way too crowded in here for me! Well, it’s Monday and thank the stars we had our two regular volunteers help us clean cages this morning! Well technically I just oversee the cleaning that gets done, but still… Without them we would not have been able to open our shelter on time and we had a lot of people that came in to look at our dogs. Hopefully some of them will be back to adopt them. 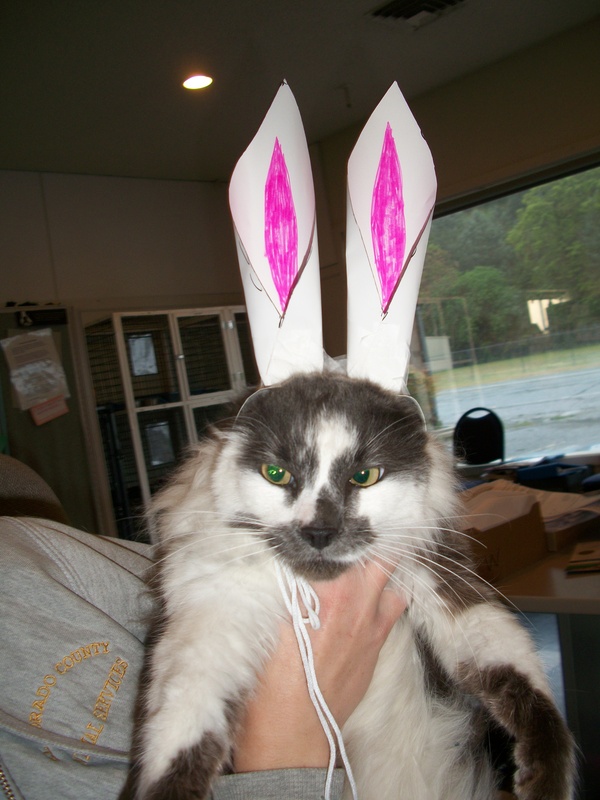 ~ Jazzmine said she had a great time spending Easter evening away from the shelter with one of our staff, but she really wishes she had a real forever home to spend every day and evening with. That made me feel a little sad. 😦 But today we had two “Pitties” go home! In case you were wondering, a “Pitty” is what we refer to for a Pitbull. It has nothing to do with feeling pity, although I often do for this breed since many people unfortunately judge them (as with some other type breeds) before they ever meet them. ~ Let’s see…we had yet ANOTHER dog come in for quarantine today because it bit someone. For some reason there have been several dog bites lately! ~ Three dogs came in and not ONE of them had an ID. 😦 ~ We also had yet another dog surrendered because the owners had to move to an apartment that doesn’t allow pets. ~ “Phyllis” the female cat got adopted! Hurray! A well-deserved female if I do say so myself. 😉 ~ “Elroy” the adorable (for a dog that is) Aussie mix pup also got adopted. ~ And “Blake” the Catahoula mix pup will be going to his new home tomorrow because he got adopted too! Oh woe is me!! Rosie and I had so much fun last night celebrating the adoption of Gru and William, but I sure felt lousy a number times. 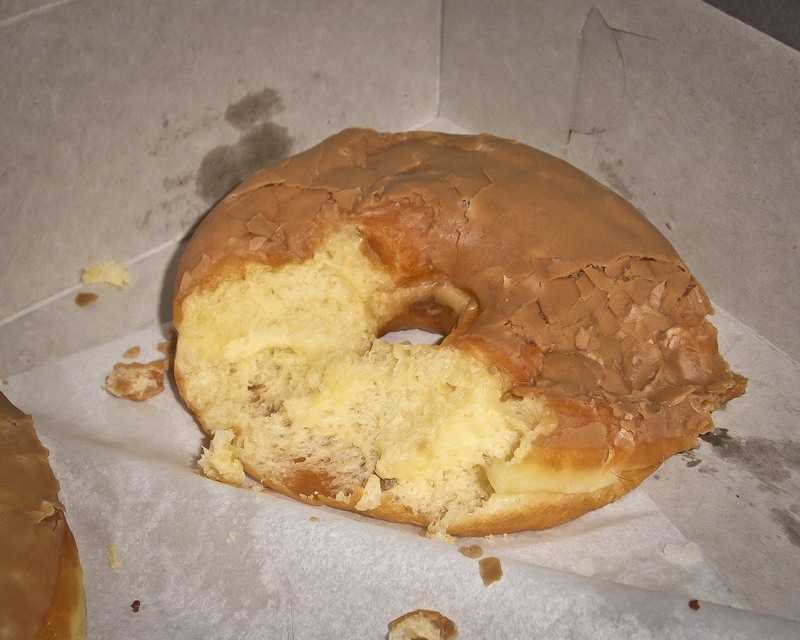 I don’t know what a doughnut is actually made of but once we started licking and chewing off tasty bits we sure felt energized! She and I reacted as if we had been exposed to catnip, only with the addition of occasional puke we left behind on the floor in various places in the office. The baggy of cereal she and I managed to share was delicious too! I’d forgotten how much fun I use to have staying awake late at night like I used to back in my younger days of prowling the streets. We played “Chase Me, Attack, and Run!” for several hours without any interruption of people. It was a fabulous party!! I didn’t realize until the morning how many things we managed to knock over during our play, but I could tell by the surprised look on staff faces when they came in this morning that they were not at all shall we say “happy campers.” Then I heard it, my name in THAT tone. Ugh! It really wasn’t that big of a deal…at least I didn’t think so. Surely the few claw-torn reports are easily put back together with a little tape. ~ Fortunately any bad feelings were short-lived. I knew all was back to normal again when staff began to laugh at the whole situation once everything was put back in place and all the shelter animals had been fed, cared for, and it was business as usual. The day ended being a good day in everyone’s eyes after all, including staff. We all felt joy seeing Mollie, the puppy I talked about on Saturday, go home with her forever family today. ~ Staff were sure to remember I was placed in my cage at the end of the day and Rosie, she even has a lock on hers. Guess no more parties for us in the future. Mystery doughnet left as evidence of Bullet's party. Well, it’s lights out here at the Shelter now so I thought I would update you on our day. Besides, I’m usually locked in my cage for the evening, but that’s not the case tonight. ~ We had a happy day today! 🙂 We had two cats (“William” and “Gru”) that have been here at our shelter for several months now waiting for their turn to get adopted. William has been here essentially since mid-December. He was adopted once before for just one week, but then he was returned because he was just too hyper and crazy playful for the family. And Gru, well, he’s been here since mid-February and has a very similar personality. These two have been housed together for a very long time now and have gotten use to having each other around. In fact, they are always cuddling up with one another and making sure each other are well groomed. I was starting to become a little discouraged about how long the two of them have been here, but that all changed today. Both William and Gru were adopted today! And not only were they adopted, they were adopted TOGETHER!! *sniffles* I just love happy stories like this. I’m keeping my paws crossed that we don’t see them in here again! ~ Wait a second…I just noticed Rosie, a domestic short-hair cat, got out of her cage!? I don’t know how she does it? I’ve seen her figure out how to open her cage door before, but never at night! *snicker* Hey! She found some leftover doughnuts on the counter. I’m sorry, but I’m going to have to go now…I can’t let her eat those doughnuts alone now can I? Besides, I think we need to party and celebrate the fact that William and Gru were adopted together today…woo-hoo!! *doing the kitty jig! * ~ *Meow! * ~ *Hmmm…mmm…mmm! * ~ Woo-hoo!!!!! Nothing exciting to post for today. Surely this must mean that the full moon is completely gone! We performed our usual work with minimal disruptions. I mostly provided staff oversight (which basically means I watch staff with my eye) while they perform their work. I like to watch them walk back and forth through the shelter as they clean kennels and cages and make sure all the animals are fed and cared for. ~ We did have one newborn kitten come in and what a cutie!! That little fur ball will be going to a foster home tomorrow where it will be bottle fed until its old enough to go up for adoption. Fortunately we have some wonderful volunteers that are able to provide foster homes and can give kittens the care and attention they need to get them ready to be adopted. ~ We also had two stray dogs come in today and some Aussie mix puppies that were surrendered. These little guys will be up for adoption this weekend! Ha ha! Thankfully I didn’t get itchy eating the ‘restricted’ cat food over the weekend. I feel perfectly fine and no cone of shame for me! Whew! ~ It’s been a pretty quiet day today, but I found out that the horse that was stuck in the ditch got up and out just fine. It took the help of the local fire department, their winch, and the veterinarian’s anesthetics in the process. Thank goodness for all of these people who provide selfless services! If horses could talk I’m sure we would hear something like, “My heroes!” 🙂 ~ “Paisley” the kitten got adopted and “Mocha” a German shepherd pup got adopted by her foster mom. Mocha must have batted those big, beautiful brown eyes. Who could resist? Oh, and one stray little Chihuahua with an injured leg came in, too. That’s it for today…time for me to go catch up on some sleep! But wait, there’s more! Our officers also had to respond to a call about an injured horse stuck in a drainage ditch. These cases also require responses from a local large animal veterinarian and the fire department to try and help the horse. I heard that the horse was distressed and couldn’t get up on its own. Oh, and let’s not forget to mention all the other routine calls our poor officers had to squeeze in. We only had 2 officers working in the field today! I didn’t get ANY naps and I didn’t see any of the staff get an opportunity to take a single break! I even lost count on the number of people that came into visit our animals today. In fact I think they got more attention today than ME! That’s okay. I can handle sharing attention as long as I’m not completely ignored. We all like attention, including my animal friends in the cages and kennels. My only complaint really is when we have so many visitors my daily naps get interrupted. Remember I need to have a minimum amount of sleep to maintain my handsome coloring and healthy fur. It takes a lot of energy for staff to assist so many visitors. So much so that just watching them work today made me very tired and hungry for some flavorful cat food. On occasions I get a craving for cat food that tastes better than what I’m allowed to eat because of my food allergies. But today was more than I could resist! I couldn’t help myself! Now please don’t think that I’m an opportunistic kitty, but the other cats’ food was just THERE! I figured just a few tasty morsels would be okay. Besides, staff were too busy to prevent me from having this wonderful, dreamy moment of remembering what it was like to eat ‘real’ mouth-watering cat food! Oh yeah, baby! Not that fake, tasteless food they usually feed me that comes in a container that stating it’s supposedly “special” cat food. Let me just tell you there’s nothing special about it…except maybe the price. Anyway, it didn’t last long before I heard THE VOICE. My name called out in that awful tone that means “bad kitty!” That sound ALWAYS makes me scamper away quickly even though I do try to pretend nothing really happened, but oh yum! My goodness that was good! I licked around my entire mouth to get any lingering flavor that may have been left on my fur or whiskers around my mouth. I even made sure I wiped my paw along my face and cheeks and licked my paws to extract any and all lingering flavor of real food! It was hypnotizing! But once the hypnotism wore off I began thinking sensible again. Now I’m just praying it won’t be so bad that I can’t control my scratching tomorrow! If they catch me scratching too many times they just may break out the “cone of shame” and make me wear it. Grrr… I don’t like the cone of shame! Keeping my paws crossed that doesn’t happen to me. Okay enough about me. The dogs Brynn, Grover, and Dahu all went to their new homes! Mollie the Golden Retriever/Husky mix puppy was adopted. She’ll only be here now through Wednesday to get spayed and then she gets to go to her new home. We also had 2 stray dogs go home, but Jynx the gorgeous Himalayan cat (who is almost as gorgeous as me) got returned. 😦 Lastly, 2 stray dogs came in. One of them had to be quarantined because it bit someone.